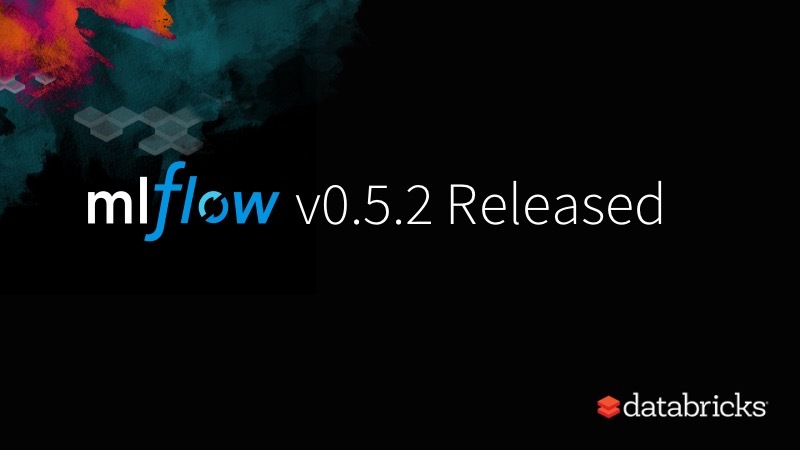 Today, we’re excited to announce MLflow v0.5.0, MLflow v0.5.1, and MLflow v0.5.2, which were released last week with some new features. MLflow 0.5.2 is already available on PyPI and docs are updated. If you do pip install mlflow as described in the MLflow quickstart guide, you will get the recent release. In this post, we’ll describe new features and fixes in these releases. As part of MLflow 0.5.2 and continued effort to offer a range of machine learning frameworks, we’ve extended support to save and load Keras and PyTorch models using log_model APIs. These model flavors APIs export their models in their respective formats, so either Keras or PyTorch applications can reuse them, not only from MLflow but natively from Keras or PyTorch code too. To query past runs and experiments, we added new public APIs as part of mlflow.tracking module. In the process, we have also refactored the old APIs into mlflow module for logging parameters and metrics for current runs. So for example, to log basic parameters and metrics for the current run, you can use the mlflow.log_xxxx() calls. While the former deals with persisting metrics, parameters and artifacts for the currently active run, the latter allows managing experiments and runs (especially historical runs). With this new APIs, developers have access to Python CRUD interface to MLflow Experiments and Runs. Because it is a lower level API, it maps well to REST calls. 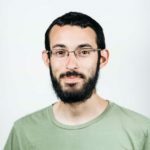 As such you can build a REST-based service around your experimental runs. 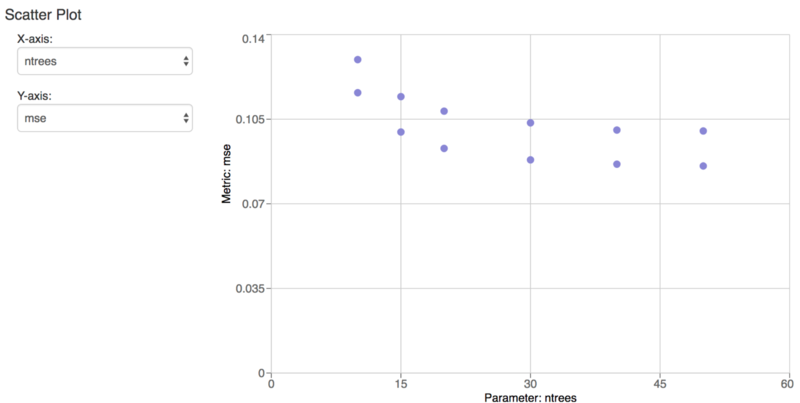 Thanks to Toon Baeyens (Issue #268, @ToonKBC), in the MFlow Tracking UI we can compare two runs with a scatter plot. For example, this image shows a number of trees and its corresponding rmse metric. Also, with better columnar and tabular presentation and organization of experimental runs, metrics, and parameters, you can easily visualize the outcomes and compare runs. Together with navigation breadcrumbs, the overall encounter is a better UI experience. The full list of changes and contributions from the community can be found in the 0.5.2 Changelog. We welcome more input on mlflow-users@googlegroups.com or by filing issues or submitting patches on GitHub. For real-time questions about MLflow, we’ve also recently created a Slack channel for MLflow as well as you can follow @MLflowOrg on Twitter. MLflow 0.5.2 includes patches, bug fixes, and doc changes from Aaron Davidson, Adrian Zhuang, Alex Adamson, Andrew Chen, Arinto Murdopo, Corey Zumar, Jules Damji, Matei Zaharia, @RBang1, Siddharth Murching, Stephanie Bodoff, Tomas Nykodym, Tingfan Wu, Toon Baeyens, and Yassine Alouini.